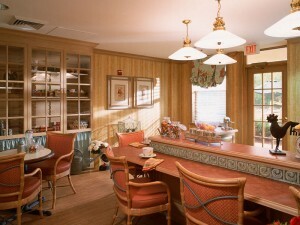 Why live alone when you can love living in a community of friends with transportation, housekeeping and delicious meals? MEET RUTH NELSON, A BRONX NATIVE WHO LEFT HER FAMILY HOME OF 69 YEARS FOR A LIFE SHE LOVES AT THE FOUNTAINS. Ruth’s parents lived in the Bronx, not far from Yankee Stadium. After welcoming Ruth into the world, they bought a house on Mace Avenue, which would become Ruth’s home for the next 69 years. She has fond memories of their summers on Sparkle Lake. After high school, Ruth started a secretarial career with Nestlé and Mobil Oil Corporation, retiring from Mobil as an Executive Secretary in their legal department. Ruth’s hobbies have included traveling with friends throughout Europe, Canada and the U.S., playing the piano, crocheting, knitting and raising and caring for pets. 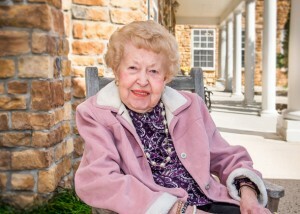 At The Fountains, she loves nothing more than sitting on the porch drinking lemonade with her good friend, Jean. Meet Ruth over a drink in the dining room or cappuccino on our terrace. Just call 1-914-574-2393 to set up a time. Bring your questions and get honest answers straight from the source.